About 20 years ago, we took on a little family activity to put together this 1000 piece puzzle of the Western Wall ("The Kotel") in Jerusalem. We all sat around the dining room table in my parent's house working to put the puzzle together. It was a pretty tough puzzle, since the pieces of a large part of the puzzle, The Wall, looked so similar. But it was something we all rallied around, had fun with, and figured out as a family. The only problem we couldn't readily solve, came down to the last piece of the puzzle, and almost smack center--it was missing. A 1000 piece puzzle with only 999 pieces. My dad, ever the innovative one, took out a marker and colored in the missing piece. 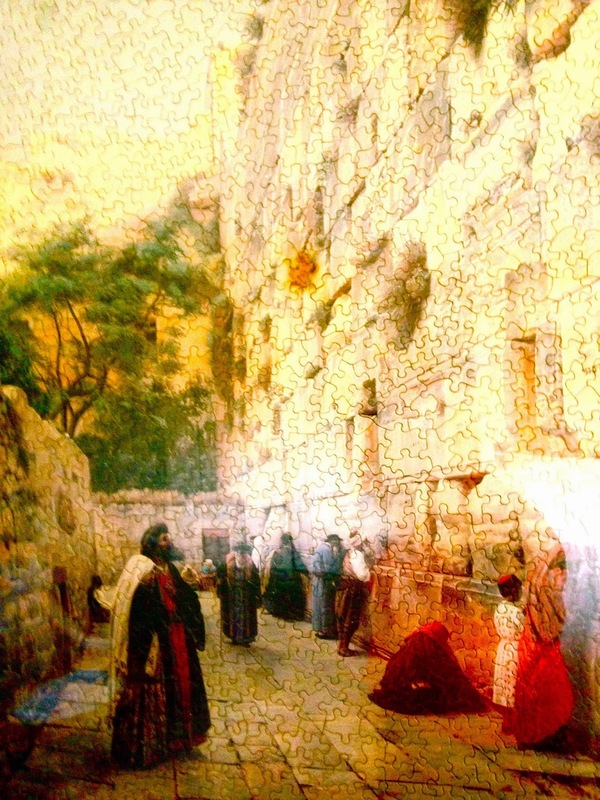 He framed the picture of the holy Kotel and hung it in their living room. I was amazed that he took such great pride in the puzzle we worked on, since it was imperfect. But it taught me that while nothing in life is perfect, it is our bonding together in love that creates a type of spiritual perfection. It was also interesting to me that like Jews now-a-days put little pieces of paper ("Kvitels") with their deepest prayers into the crevices of the Western Wall, my dad put the families last piece into the representative puzzle picture of it. Finally, the Western Wall is itself just a piece of the destroyed (twice) holy Temple ("Beit Hamikdash") that stood in Jerusalem, and one day hopefully it will be rebuilt with all the pieces through the loving bonding of the people that yearn for that special connection to the Almighty again.